Islamic extremism will still pose the main threat in the short term, while Daesh is still called “the most effective global entity”. Analysis by Umberto Saccone, IFI Advisory’s Board President. 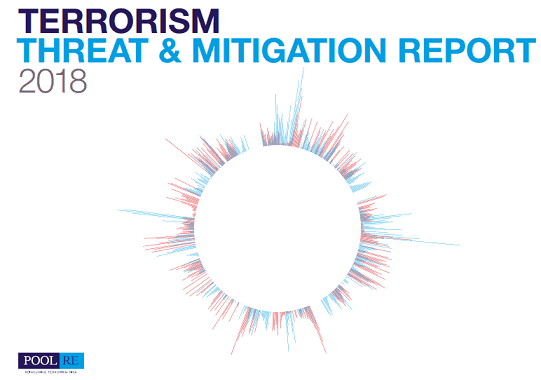 The British insurance group Pool Re has recently released a report (Terrorism Threat and Mitigation Report), which contains a detailed and interesting assessment of how the terrorist threat has evolved since 2014. Over time, Pool Re has grown increasingly influential also in areas other than insurance, but closely related to it (politics and security). Its main objective is to provide effective financial protection to businesses in the United Kingdom, by insuring assets and property worth over £ 3 trillion in the whole country. Pool Re has a Terrorism Research and Analysis Centre (TRAC) that aims at improving awareness of current and emerging terrorist risks, working in the interests of clients and institutions. It cooperates closely with the British authorities: on 23 December 2018, the Sunday Times, the Sunday edition of the Times, called it “the government-backed terrorism reinsurer”. Though focused on the threat to the United Kingdom, the report features a general analysis. Data and assessments also refer to other European countries: the whole Western world has to face a threat that, despite taking different forms, is posed by individuals and groups inspired by the same ideas and sharing similar methodologies and targets. 46% of the attacks were carried out in the Middle East and North Africa (48% in Iraq). In the period considered, 8 terrorist events were reported in the United Kingdom (4 in 2017), with 37 dead and 261 injured. If we have a look at the attacks carried out in Europe since 2017, most of them have been performed by individuals influenced and led by extremist groups or having “self-radicalised”, through the use of low-tech methodologies. Besides law enforcement and government representatives, the main targets were crowded places too. “Homegrown” terrorists, inspired but not necessarily led by Daesh (IS) and Al Qaeda (AQ), still pose the main threat. Attacks performed by militants that have returned from the Middle Eastern war zones cannot be ruled out, as well as high-profile attacks by Daesh and AQ. The main target of Al Qaeda is probably the civil aviation sector (airplanes and airports). Even though far-right movements are a real risk, Islamic extremism will still pose the main threat in the short term, and Daesh is still called “the most effective global entity”. After the defeats in Syria and Iraq, Daesh has entered, perhaps intentionally, a “survival mode” to find its operational capacity back, regroup and rearm. However, its ideology is far from disappearing. Indeed, Daesh-affiliated groups have recently emerged in Afghanistan, Yemen and Southeast Asia. According to anti-terrorism expert Ali Soufan, the fragmentation of the Islamic State could lead to new groups, sometimes more violent and more capable than the original core of the organisation. Given the above, Afghanistan might again be a source for jihadist terrorism and a base of operations for both AQ and Daesh. The Khorasan Province, a Daesh branch active in Afghanistan, has intensified its operations, and the members of the International coalition that supports the Kabul government consider it a threat to the national security of their own countries. Such situation has already been reported in Yemen, where the local AQ-affiliated group (AQAP) has proved to be able to hit Western targets as well. As for the United Kingdom, the terror alert will hardly decrease in the next two years, even though in 2018 there was a 22% drop in the number of arrests compared to 2017, when they rose following the four attacks carried out in that year. In any case, 351 people are now in prison on terrorism charges, 82% of whom are suspected of ties with Islamic extremism. Of the approximately 900 British foreign fighters who have left the United Kingdom to reach Syria or Iraq in the past few years, 40% have returned home and 20% have died in combat: there are 360 left. About 3,000 highest-risk people are currently investigated and monitored by the security forces and law enforcement authorities. We should also focus on those who leave prison after serving their sentences. In late 2021, only 40 of the 195 arrested from 2007 to 2016 will still be in prison. Fortunately, the recidivism rate for terrorist crimes is 10-20%, therefore lower than in other types of crimes, where it can reach 50%. In conclusion, as regards how the threat has evolved in the United Kingdom, we can now expect: persistent and perhaps increased risk of attacks by Daesh and AQ (some may be more serious than those of 2017), increased attempted attacks by right-wing extremist groups, persistent threat by groups like the new IRA. Most of the attacks since 2014 have been carried out with firearms, which have been the most widely used kind of weapon in all regions except Europe, Central Asia and the South Pacific, where firearms are ususally subject to stricter checks. By contrast, bomb attacks (suicide bombings or car bomb attacks) have been more frequent in Africa, South Asia and the Middle East. In the period under consideration, there was a shift from “directed attacks” (conceived and planned outside Europe) to “inspired attacks” (performed by individuals with little direct connection to groups operating in other areas) in continental Europe. In 2015, 57% of individuals involved in Islamist attacks were directed by foreign groups; in 2016, this percentage dropped to 19%. In 2018, all attacks recorded in Europe were carried out by “inspired” individuals. In Britain, foreign groups were directly involved in the attack at the Manchester Arena. Those responsible for Islamist attacks in Europe often show common features: 44% were residing in the countries where the attacks took place; at least 34% had been convicted for criminal offences; 38% were known to the police and included in the lists of potential terrorists. A chapter of the report is about Risk Management and Mitigation. Related measures include the process to amend the law governing insurance contracts to also include coverage of business interruption-related losses due to terrorist events that do not result in material damage to property. The legislative process is expected to be completed by 2019. Through the TRAC, Pool Re provides its customers with the necessary information to better assess risk and also adjust insurance coverage. Other initiatives include developing the Vulnerability Self-Assessment Tool (VSAT), holding terrorism risk management training courses and enhancing international cooperation through the International Forum of Terrorism Risk (Re) Insurance Pool (IFTRIP), which offers the opportunity to exchange information and experience to reduce the risk of economic damage in the event of terrorist events. The final chapter of the Report is about unconventional attack methodologies, covering CBRN attacks, i.e. those with drones and with the use of electronic devices. The use of chemical agents is a real risk, as evidenced by the attempt to use hydrogen sulfide (H2S) in a foiled Daesh-blamed attack in Australia. Attacks of this kind are relatively easy to plan, because the necessary substances can be bought legally or, like the H2S, produced following instructions posted on the Internet. Civil aviation is particularly vulnerable to chemical attacks. In contrast, though possible, the use of radiological and nuclear substances is very unlikely because these materials are generally controlled and storage is well monitored by the authorities. According to the report, drones can be used for terrorist purposes too. In the United Kingdom, a new law that came into force on 30 July 2018 sets further restrictions on the use of unmanned aircraft, which are not allowed to fly above 400 feet or within one km from an airport perimeter. These measures, and others that could be enforced soon, do not make it less likely for drones to be used for attacks, even against targets other than an airport, as already occurred in several countries. The risks posed by jihadist groups to the security of air connections were discussed in a mid-December 2018 summit held by British Minister for Security Ben Wallace and attended by executives from the country’s airports. Wallace pointed out that after the decline of Daesh, AQ is trying to reassert itself as the world’s largest terrorist group, and that a resounding attack on the civil aviation would be its calling card. The terrorists are allegedly designing new weapons to shoot down a commercial aircraft and could use explosive-carrying drones to destroy a key target. The warning of the Minister and the Pool Re Report explains why the executives of Gatwick Airport (the second most important airport of the British capital, after Heathrow) were so concerned about the drones noticed near the airport (19 December 2018). For three days, airport activity was suspended or severely restricted, more than one thousand flights were cancelled and 140,000 passengers had to reconsider their travel plans. The police conducted frantic investigations, arresting a couple (Paul Gait and Elaine Kirk) living in a nearby area; the two were, however, released after 36 hours because the evidence against them proved to be groundless. At the same time, priority was given to plans to equip airport police with SkyWall 100 systems, i.e. grenades containing a net: near the drone, the grenade opens and the net wraps the drone making it fall to the ground hanging on a parachute. The system seems to have already been supplied to a group of police officers working at Heathrow airport. The Gatwick drone incident sparked controversy: the authorities were accused of ignoring the warnings issued by pilots and air traffic controllers. Other experts stated that what happened at Gatwick was proof of the country’s lack of preparation and vulnerability to such threats. It is not enough to approve very stringent legislation on the use of drones, we must be able to enforce it and prevent violations: these are words by Kenneth Quinn, head of Global Aviation at the law firm Baker McKenzie.